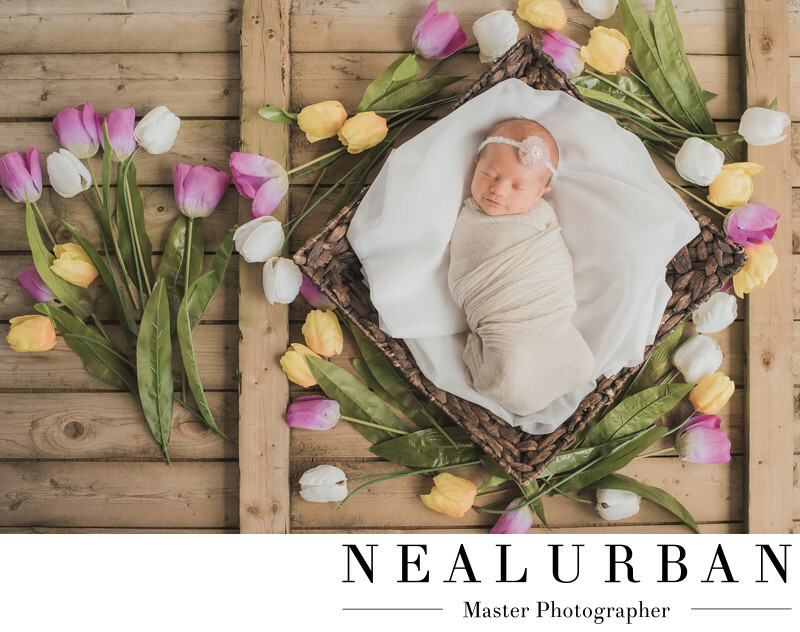 Newborn sessions at Neal Urban Studio can be amazing! We love to create sets and ideas that families will always remember. We have documented this families journeys for many years. We photographed Lindsey and Josh's engagement portraits, wedding photos, christmas sessions, maternity photos, and now newborn portraits. Baby Ella was such a joy to photograph. We started off the session with family portraits. Then it was time for solos! Lindsey and Josh have always had rustic style photos and ideas. So, we wanted to tie in the same theme and style for the newborn photos. We had an old piece of wooden fence we thought would be great to use. We love to find antique and authentic props for all of our shoots. For newborn portraits, most parents want the sleeping baby style photos. That is not always easy! We need to have the studio very warm and mom needs to feed the baby right before or when they arrive to the studio. In industry terms, the baby needs to be milk drunk. This way, the baby is sound asleep and allows us to create images like this. We knew baby Ella was in a deep sleep. She must have been having some great dreams too! Look at this smile! She was wrapped super tight and placed on a padded basket! The basket was placed on the wooden fence and Neal took the image over head. We decided to add in the flowers for a pop of color and feminine touch! We can not wait to capture more photos of this gorgeous baby and her family! Next up, another family portrait session and first birthday cake smash photos!